INDIANAPOLIS -- The Indiana Pacers routed the top seeded Denver Nuggets 124-88 on Sunday at Bankers Life Fieldhouse. A scorching hot Bojan Bogdanovic led the Pacers with 35 points and six rebounds, shooting 13 for 16 from the field and 5-for-6 from long range. Myles Turner collected 17 points and 11 boards while Domantas Sabonis spearheaded a strong bench performance with a double double of 15 points and 13 rebounds. Denver appeared to take a day off as their offense stayed stagnant and Indiana was able to score wherever they wanted with ease. 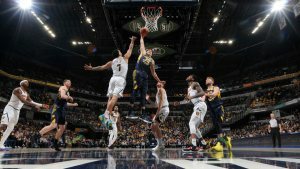 Looking to overcome a 16 point halftime deficit, coach Mike Malone deployed his starters for the entirety of the third period, but to no avail as the Pacers shot 50 percent from the field compared to the Nuggets’ 29 percent. Down by 25 at the start of the fourth stanza, Denver's starters didn’t even see the floor in the last period. Known for their talented scorers, Denver failed to have anyone tally 20 points. Nikola Jokic led his team with 19 points 11 boards and 8 assists. But every other Nugget struggled: Jamal Murray and Will Barton each turned the ball over four 4 times while Murray and Millsap combined for a mere 10 points on 20 percent shooting. The Denver Nuggets will look to bounce back from this embarrassing defeat when they host the Detroit Pistons on Tuesday. Denver will not be taking their remaining 10 games lightly as they seek to beat out Golden State for the West's top seed. The Pacers continue to impress as a Top-4 Eastern Conference team despite being without their superstar, Victor Oladipo, who has been out since January 23. Indiana continues to hold a two game lead over the fifth-seeded Boston Celtics for homecourt in the first round of the playoffs. They will look to build off this impressive win when they challenge another western conference powerhouse, the OKC Thunder, on Wednesday night. Click here to view a list of other articles written by Japheth Bandi.